Alimony Tax Deduction: Is It Too Late To Divorce in 2018? Have you heard the news about the alimony tax deduction? It is going away for divorces finalized after December 31, 2018. But fear not! If you and your spouse act smartly and quickly, you can still lock in your alimony tax deduction. What is the Alimony Tax Deduction? The alimony tax deduction is currently enshrined in 26 U.S. Code section 215. It states that alimony (as opposed to child support or distribution of property) can be tax deductible to the payor and taxable to the payee. This means that the person who pays alimony will pay less in taxes, and the person who receives alimony will pay taxes on it as if it were regular income. https://familydiplomacy.com/wp-content/uploads/2018/04/Alimony.png 334 640 Adam https://familydiplomacy.com/wp-content/uploads/2016/12/Family-Diplomacy-Logo.jpg Adam2018-09-20 07:32:192018-11-09 10:06:10Alimony Tax Deduction: Is It Too Late To Divorce in 2018? At the beginning of this project, I distributed 5000 questionnaires to family lawyers around the country. I asked the lawyers to respond by estimating the spousal support award, if any, that would result for six hypothetical divorcing couples in their jurisdiction. While the response rate was not great, the responses received suggest that there are three different types of spousal support systems in the U. S. today. In some states, spousal support is rarely awarded, and then only to prevent severe hardship. In others, spousal support is frequently awarded when the spouses’ incomes are substantially different at divorce. In most states, however, it appears that there is no clear spousal support policy, and the award, if any, in any given case is the result of which judge is assigned to hear the matter. In these states, spousal support determinations appear to be arbitrary. I have included as an appendix to my article a summary of the responses. Some states have responded to this lack of clarity regarding spousal support standards by adopting guidelines. These guidelines attempt to provide more uniformity in terms of award amounts and award duration. To date, they have not attempted to provide guidance regarding when a spousal support award is warranted. In this article, I discuss how spousal support standards could be clarified in those states where there appears to be no clearly accepted policy. I would say that Florida falls into the last category: there are no alimony guidelines, and the amount you might receive or pay is highly dependent on the whims of the judge you are in front of. That is, if you let the judge decide the amount of alimony. More and more families are coming to realize that going through a court battle is, in most cases, the worst possible way to divorce. If you choose a private form of dispute resolution, such as the Collaborative Process, you and your spouse will have the final say on the amount of any alimony. In the Collaborative Process, you and your spouse each have separate attorneys to guide you. However, the attorneys are not there for opposition research or to prepare for trial; rather, they are there solely for the purpose of helping you reach an out-of-court agreement. This means that no time, energy, or money is spent fighting in court. Oftentimes, a neutral financial professional will help you and your spouse develop and analyze financial options that work best for your family. The financial neutral can do a lifestyle analysis to determine what has been spent in the past and where there might be efficiencies that can be created in a spouse’s cash flow. The financial professional will oftentimes also look into whether there are tax loopholes that might allow the family to enlarge their proverbial pie. So do your family and your future a favor and consider the Collaborative Family Law Process. Adam B. Cordover is co-author of an upcoming American Bar Association book on Collaborative Divorce. Further, Adam trains attorneys, mental health professional, financial professionals, and mediators in the Collaborative Process throughout Florida and the U.S. In a previous post, I wrote about Florida House Bill 943 and the proposed alimony guidelines contained in the bill. 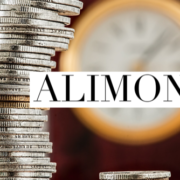 Florida currently has no guidelines for alimony, and the bill creates formulas which would implement presumptive ranges for the amount and duration of alimony that a judge could order, making awards more predictable. As an update to my prior post, HB 943 has been amended. As of the date I am writing this, the years of marriage is multiplied by 1.5%, rather than 1.25%, in the formula to determine the low amount of alimony that a judge could order. There are likely to be more changes to the bill before the it passes both houses of the Florida legislature and is signed into law (if, indeed, it makes it that far). If you are involved in a support matter involving the Florida Department of Revenue, then your case will be heard by a Child Support Hearing Officer, rather than a judge. But what are the powers of the Hearing Officer? Many jurisdictions require spouses to be legally separated for a certain period of time (oftentimes about 6-12 months) before they can get a divorce. Florida does not have such a requirement. However, there are many couples out there who wish to go through a “trial separation” without taking the leap of divorce. Many want an interim step short of divorce to maintain the possibility that the parties can work things out later and reconcile. Does Florida have any mechanisms to provide protections to spouses and children during a trial separation? https://familydiplomacy.com/wp-content/uploads/2016/12/Family-Diplomacy-Logo.jpg 0 0 Adam B. Cordover, Attorney-at-Law https://familydiplomacy.com/wp-content/uploads/2016/12/Family-Diplomacy-Logo.jpg Adam B. Cordover, Attorney-at-Law2013-09-28 16:33:162016-03-14 09:52:49Does Florida Recognize Legal Separation? Now that Senate Bill 718 on alimony reform has been vetoed by Florida Governor Rick Scott, many Tampa Bay residents are wondering whether there is any way to modify or terminate their alimony obligations. The answer, in many cases, may be yes. Chapter 61 of the Florida Statutes states that most types of alimony may be modified or terminated when there has been a substantial change in circumstances that affects the receiving spouse’s need for alimony or the paying spouse’s ability to pay. Case law tells us that a “substantial change in circumstances” means a change that was unanticipated at the time the alimony was ordered by the Court, and a change that is permanent, involuntary, and material. Examples of substantial changes in circumstance that may justify upward or downward modification include health issues, long-term unemployment, a big raise, or a large inheritance. Florida Alimony Reform: How Long is a “Long-Term” Marriage? As Senate Bill 718 – which deals with Florida alimony and child custody reform – looks likely to be signed by Governor Rick Scott, this blog is exploring the various parts of the bill and discussing how they may affect Tampa Bay divorce and family law cases. One area that this bill changes is the way that marriages are categorized as short-term, moderate-term, and long-term. The reason this matters is because the Florida Statutes prescribes the type, quantity, and duration of alimony that a judge is likely to award depending on the length of the marriage. https://familydiplomacy.com/wp-content/uploads/2016/12/Family-Diplomacy-Logo.jpg 0 0 Adam B. Cordover, Attorney-at-Law https://familydiplomacy.com/wp-content/uploads/2016/12/Family-Diplomacy-Logo.jpg Adam B. Cordover, Attorney-at-Law2013-04-27 18:19:282016-03-15 11:25:09Florida Alimony Reform: How Long is a "Long-Term" Marriage? There has been a lot of press lately about efforts to reform Florida’s alimony laws. As discussed on this blog, Senate Bill 718 (which primarily deals with alimony reform) passed the Florida House by a wide margin (85 Yeas versus 31 Nays) and, since it had also passed the Florida Senate, will be going to Governor Rick Scott for his signature. One area that may be even more significant, but has not received as much coverage, is language in Senate Bill 718 that reforms Florida’s child custody laws. Currently, there is no presumption in favor of or against any child custody schedule, including a 50/50 split custody (known as equal time-sharing). Senate Bill 718, however, adds language to section 61.13 of the Florida Statutes that seems to make a strong presumption in favor of equal time-sharing. House Bill 231, which proposes broad-reaching changes to Florida’s alimony statute, has passed the Civil Justice Subcommittee. It next goes to the House Judiciary Committee. Alimony provides financial support to a financially dependent former spouse. The primary elements to determine entitlement are need and the ability to pay, but the statutes and case law impose many more criteria. There are four different types of alimony: bridge-the-gap alimony, rehabilitative alimony, durational alimony, and permanent alimony. An award of alimony may be modified or terminated early in certain circumstances. Eliminates consideration of the standard of living established during the marriage as a factor in determining alimony. Creates presumptions for earning ability imputed to an obligee. Requires written findings justifying factors regarding an alimony award or modification.